CHEM-GARD® CGA thermoplastic pumps with end suction, centerline discharge and back pullout construction, combine the award winning wide-open power frame of Vanton's CHEM-GARD® line of thermoplastic pumps with the standard dimensional characteristics embodied in ANSI specification B73.1. They are fully interchangeable with all other pumps manufactured to this specification without disturbing piping, base plate, foundation, driver or coupling. At the same time, they incorporate thermoplastic construction that will eliminate chemical attack and minimize abrasive wear. Vanton injection molds all fluid contact components from a range of homogeneous thermoplastics, ensuring that the wet end of each pump is chemically inert to the fluids — and resistant to the abrasives — it may encounter. These thermoplastics include: polypropylene (PP) and polyvinylidene fluoride (PVDF). The thermoplastic pump casing and flanges are protected by metal armor in order to withstand the same nozzle loadings as metal pumps, while limiting fluid contact exclusively to non-metallic components. The adjustable sliding inboard bearing design provides for quick and easy mechanical seal inspection or readjustment without disturbing the piping, while minimizing shaft deflection and impeller overhang, prolonging seal life. The open seal area accommodates most commercial seals including single, double, cartridge and balanced arrangements. Optional features include leak detection, temperature monitoring, and run-dry protection devices. 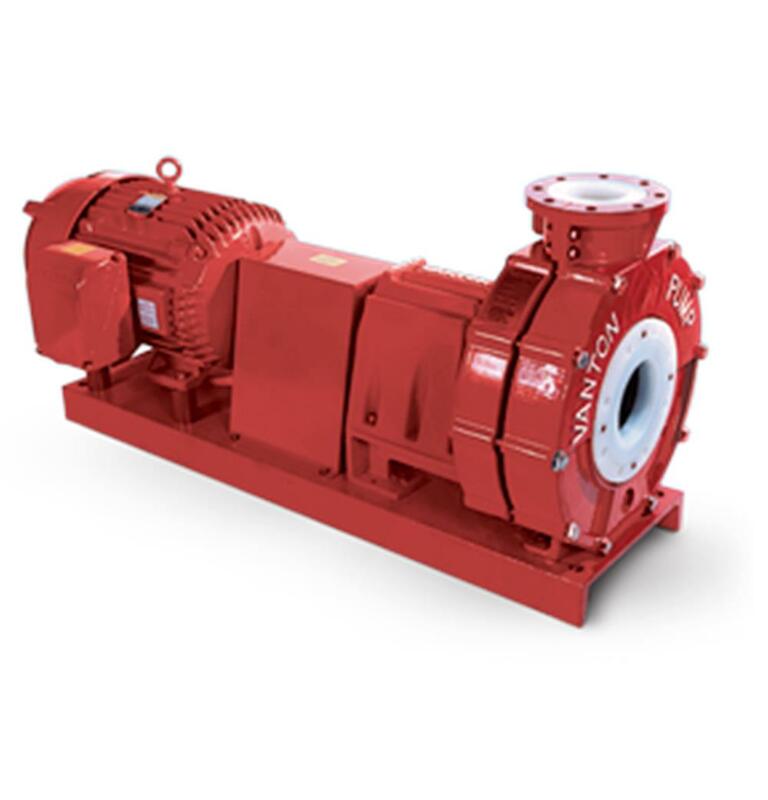 This pump available with recessed Vortex impeller for slurries and fluids containing stringy materials or solids to 2 in. (51 mm) in diameter. The adjustable sliding inboard bearing design provides for quick and easy mechanical seal inspection or replacement without disturbing the piping. Thick sectioned pump casing and cover are injection molded from homogeneous thermoplastics. Key driven, dynamically balanced injection molded impeller design with stainless steel insert ensures positive drive, provides additional rigidity to impeller at higher temperatures and pressures, and prevents damage in case of reverse rotation. Semi-open or closed impellers are available. The award winning wide-open power frame with a retractable inboard bearing assures minimal shaft deflection and impeller overhang and facilitates easy mechanical seal inspection and readjustment. The unique pedestal design allows for the use of most commercially available mechanical seals without the need for modification. 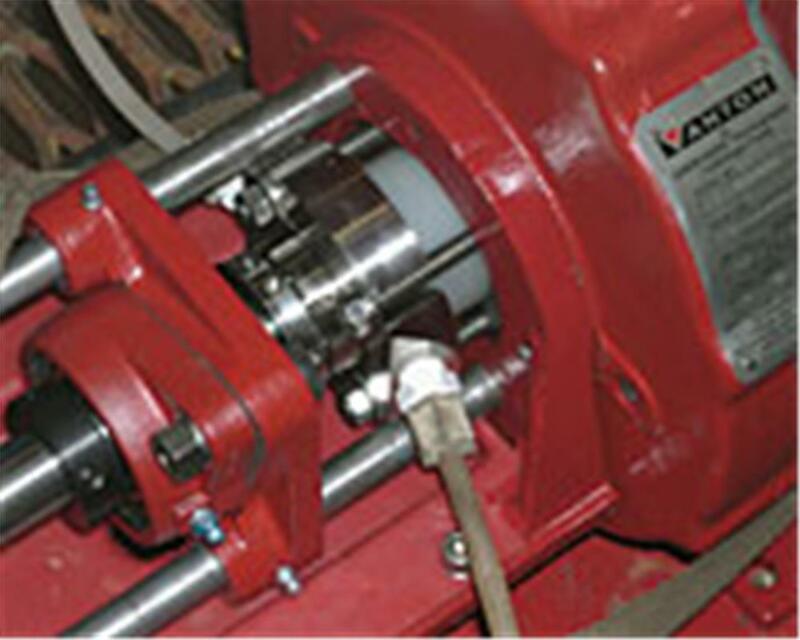 Mechanical seals are reverse mounted, exposing only the non-metallic seal faces to the fluid handled. Heavy duty, self-aligning bearings widely spaced on the shaft, assure perfect alignment for maximum stability and long seal life. The relatively short, large diameter stainless steel shaft is sleeved with thermoplastic to isolate it from the fluid. External cast iron protective armor, which also serves to carry the nozzle loadings, is coated with a chemical resistant, two-part epoxy paint to guard against chemical and atmospheric corrosion. Back pullout construction per ANSI B73.1 specification, with leveling bolt to facilitate ease of maintenance without disturbing the piping. Scroll table left and right for small devices. *Baseplate dimensions will vary slightly with motor frame size. All dimensions are approximate and not to be used for construction purposes. Pump dimensions conform to ANSI B73.1. Design specifics subject to modification as dictated by ongoing product improvement programs.